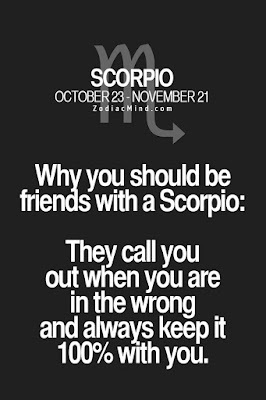 #1 Why you should be friends with a Scorpio: They call you out when you are in the wrong and always keep it 100% with you. - their emotions often cause them to act irrationally. 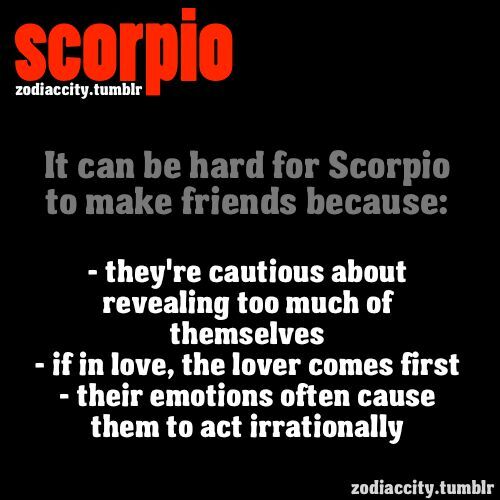 It is not easy to become a Scorpio's friend because they are deeply suspicious and wary of people. 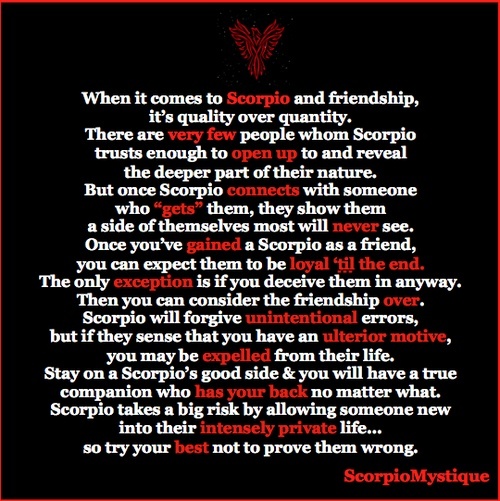 Scorpio is a very private person and they will put you through a series of trust tests to determine your loyalty. If you are lucky enough to be friends with a Scorpio, you'll have someone who will defend you no matter what. 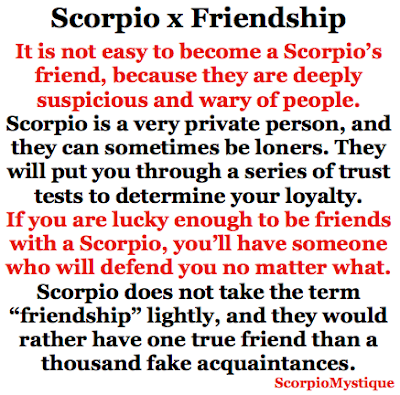 Scorpio does not take the term "friendship lightly, and they would rather have one true friend that a thousand fake acquaintances. 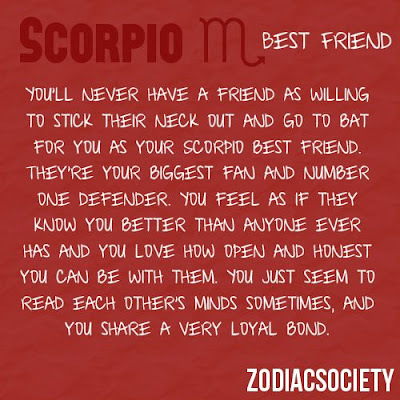 You'll never have a friends as willing to stick their neck out and go to bat for you as your Scorpio best friend. They're your biggest fan and number one defender. You feel as if they know you better than anyone ever has and you love how open and honest you can be with them. You just seem to read each other's minds sometimes and you share a very loyal bond. 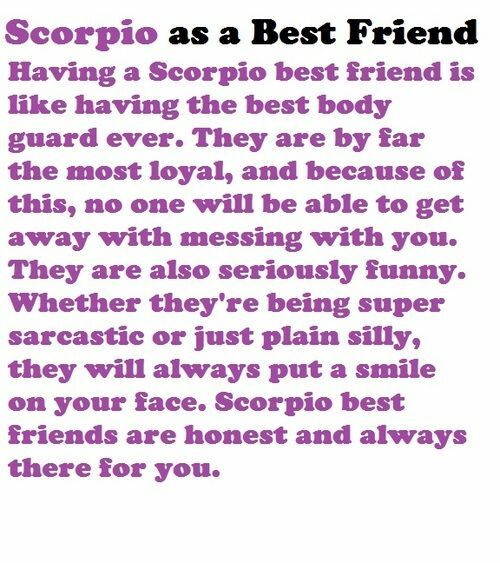 Having a Scorpio best friend is like having the best body guard ever. They are by far the most loyal, and because of this, no one will be able to get away with messing with you. They are also seriously funny. Whether they're being super sarcastic or just plain silly, they will always put a smile on your face. 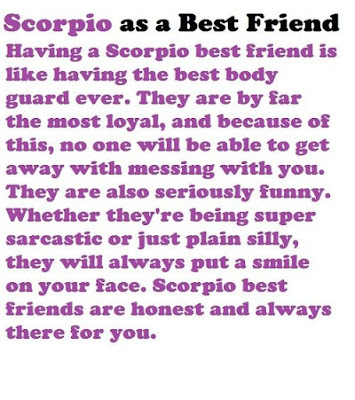 Scorpio best friends are honest and always there for you. 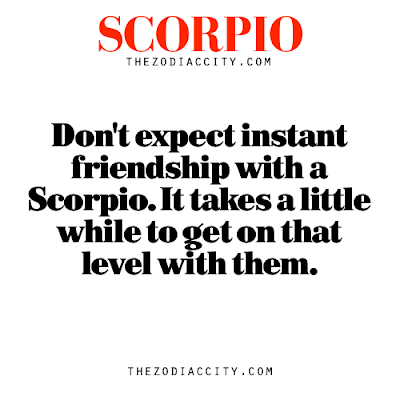 Although it may be hard to begin a friendship with the intimidating Scorpio, once you have befriended them, you've been promised a truthful and deep friendship. 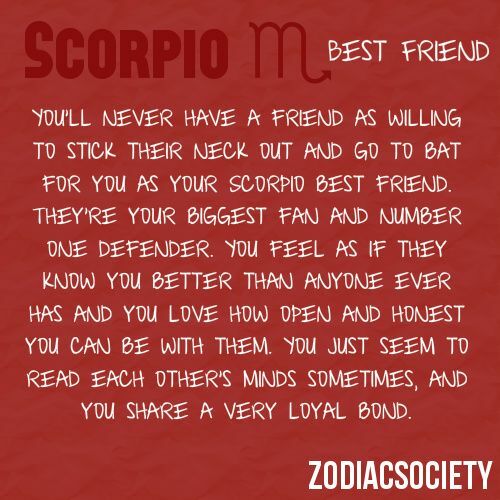 Scorpios make for extremely loyal friends, and can easily see into your heart. 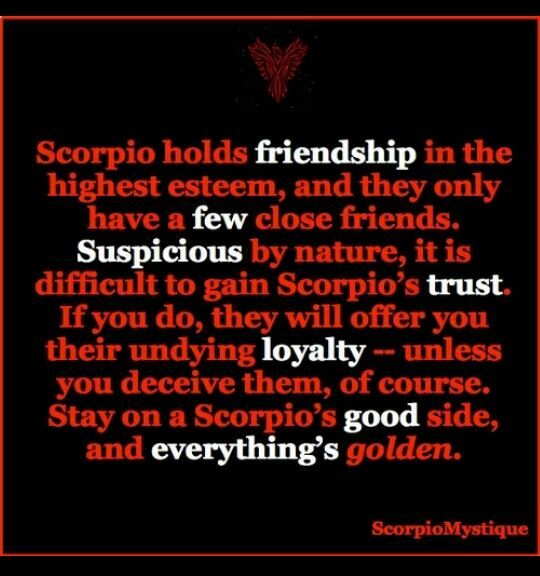 They will walk you through any tough times, and you can always trust a Scorpion friend, If you want the truth, they'll give it to you. However, they can also get jealous of other friendships you have and tend to have a vicious temper. 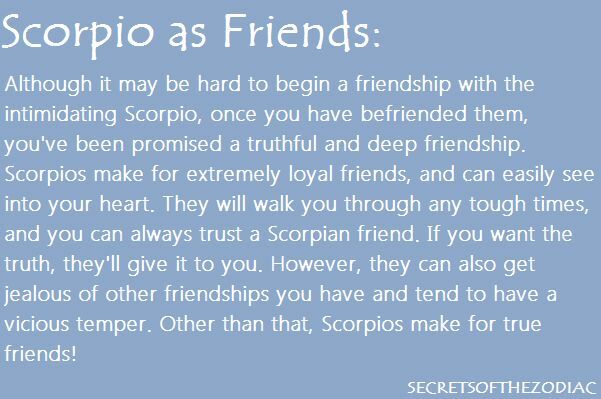 Other than that, Scorpios make for true friends! #9 Scorpio is a fierce defender of their close friends. Don't try to drive a wedge between them. 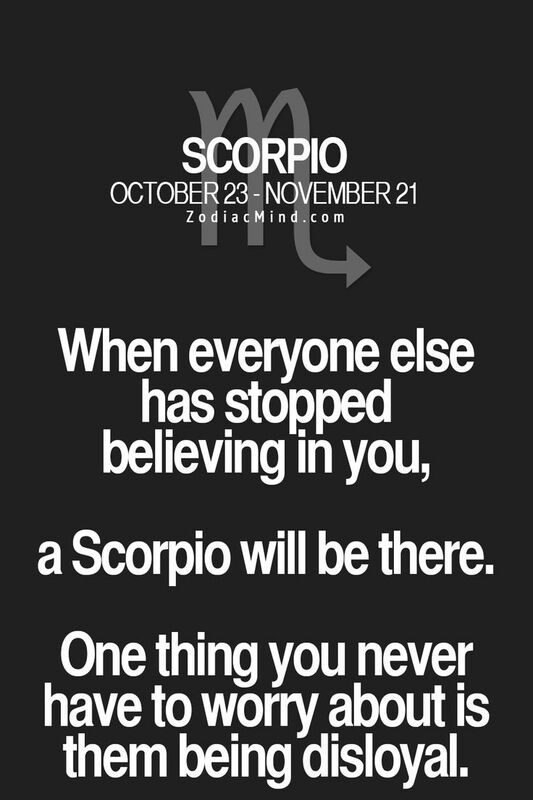 #10 When everyone else has stopped believing in you, a Scorpio will be there. One thing you never have to worry about is them being disloyal. 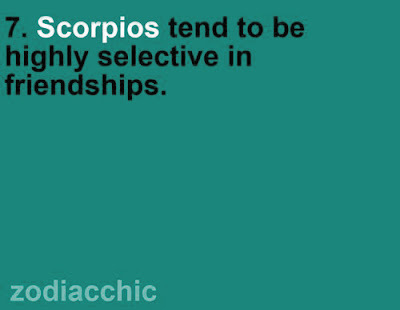 #11 Scorpio holds friendship in the highest esteem, and they only have a few close friends. 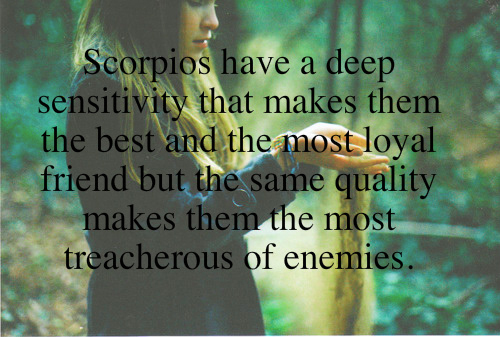 Suspicious by nature, it is difficult to gain Scorpio's trust. If you do, they will offer you their undying loyalty -- unless you deceive them, of course. Stay on a Scorpio's good side, and everything's golden. #12 When it comes to Scorpio and friendship, it's quality over quantity. There are very few people whom Scorpio trusts enough to open up to and reveal the deeper part of their nature. 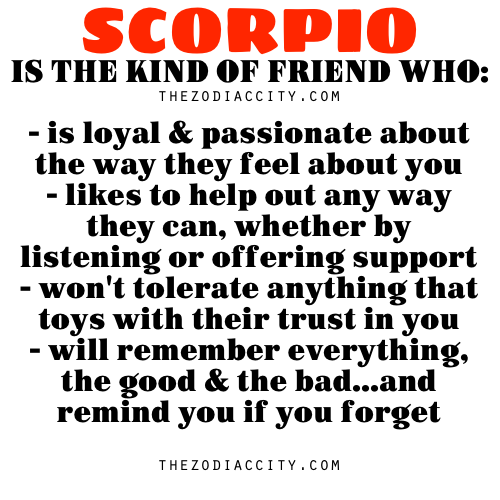 But once Scorpio connects with someone who gets them, they show them a side of themselves most will never see. 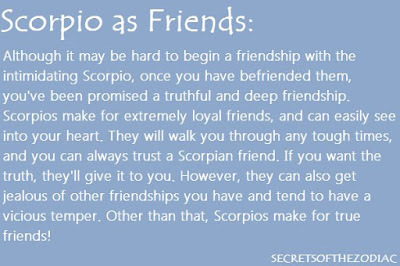 Once you've gained a Scorpio as a friend, you can expect them to be loyal 'til the end. The only exception is if you deceive them in any way. Then you can consider the friendship over. 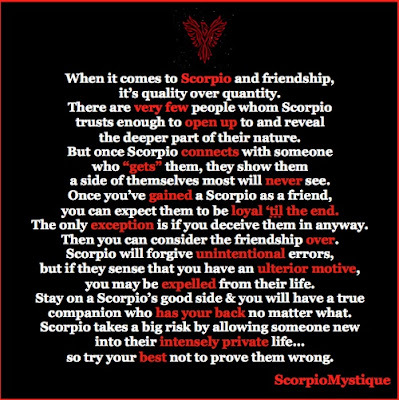 Scorpio will forgive unintentional errors, but if they sense that you have an ulterior motive, you may be expelled from their life. 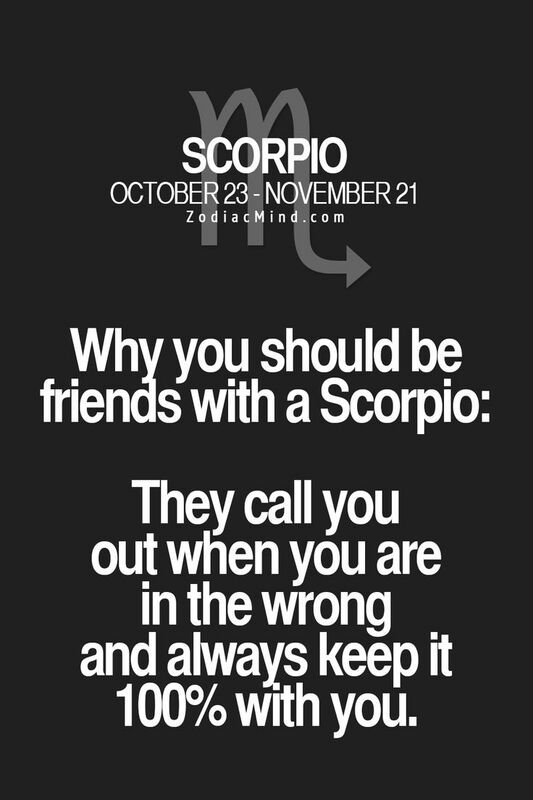 Stay on a Scorpio's good side and you will have a true companieon who has your back no matter what. 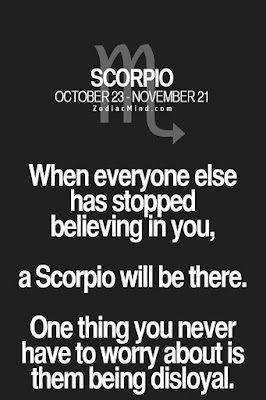 Scorpio takes a big risk by allowing someone new into their intesely private life.. so try your best not to prove them wrong. 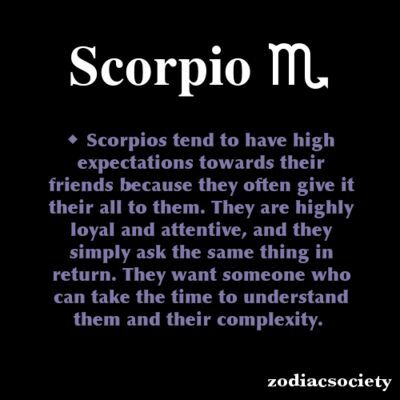 #13 Scorpios tend to have high expectations toward their friends because they often give it their all to them. They are highly loyal and attentive, and they simply ask the same thing in return. They want someone who can take the time to understand them and their complexity. 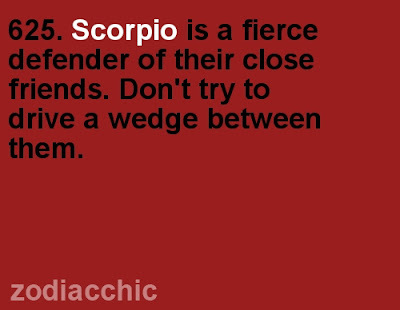 #14 Don't expect instant friendship with Scorpio. It takes a little while to get on that level with them. 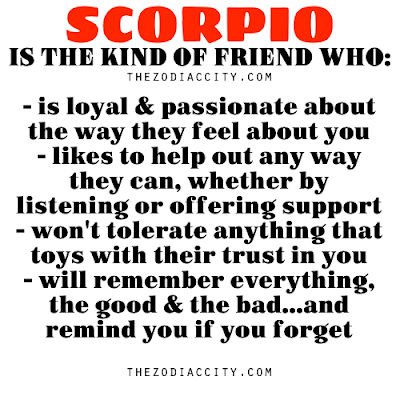 #15 Scorpios have a deep sensitivity that makes them the best and the most loyal friend, but the same quality makes them the most treacherous of enemies. 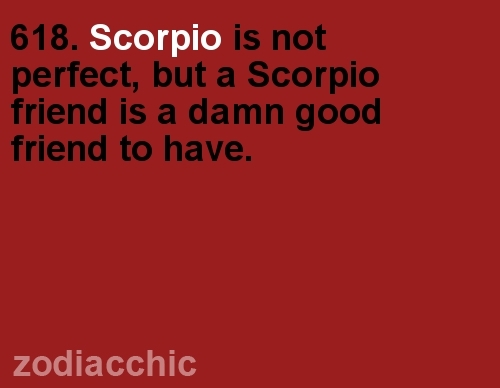 #16 Scorpio is not perfect, but a Scorpio friend is a damn good friend to have. 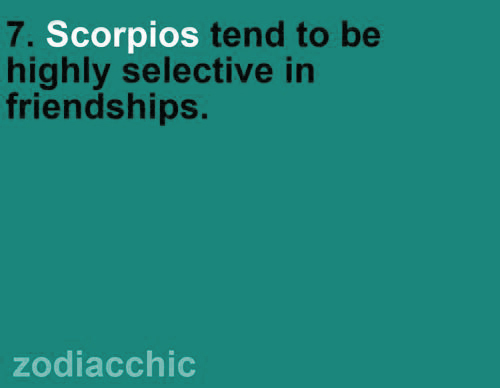 #17 #SCORPIOS are the friends who you will want to have around when things go down. 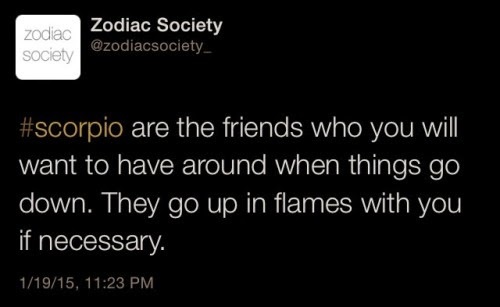 They go up in flames with you if necessary. 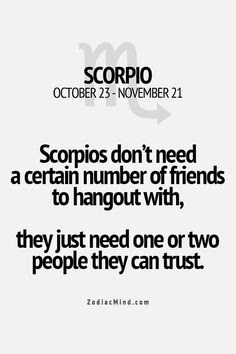 #18 Scorpios don't need a certain number of friends to hangout with, they just need one or two people they can trust.